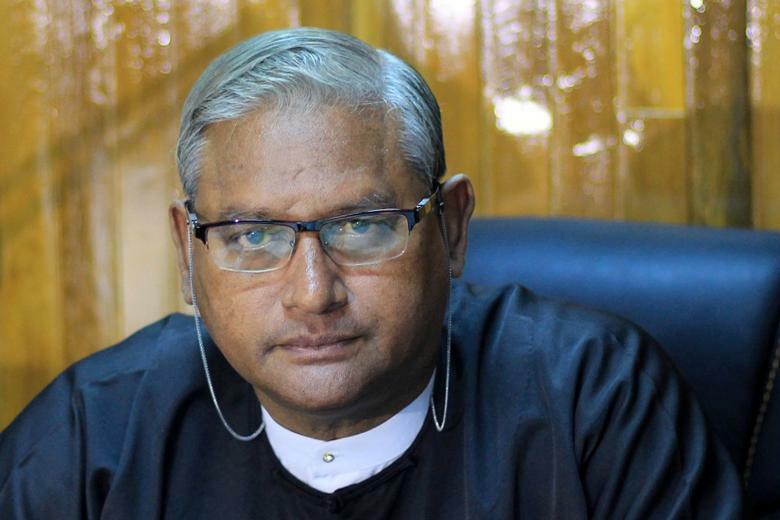 YANGON -- Myanmar's national police chief has taken personal charge of an investigation into the killing of a prominent lawyer and adviser to Aung San Suu Kyi's ruling party, police sources said, after leaks and conflicting comments by officers about its progress. The killing of Muslim advocate Ko Ni, 63 - shot in the head on Sunday in front of onlookers while he held his grandson outside Yangon's international airport - has rocked the commercial capital, where acts of political violence are rare. It comes amid heightened religious and communal tensions in the Buddhist-majority country, with a report from the United Nations human rights office on Friday saying a military crackdown on Rohingya Muslims in the northwest in recent months "very likely" amounted to crimes against humanity. Tens of thousands turned out for Ko Ni's funeral, and the public is closely watching how authorities investigate a killing the civilian president's office has called an attempt to destabilize the state. Colleagues have told Reuters Ko Ni was working on amendments to Myanmar's military drafted constitution to help the National League for Democracy-led government rule effectively in a system that keeps soldiers in control of key ministries. Major General Zaw Win, chief of the Myanmar Police Force, arrived in Yangon from the capital, Naypyidaw, on Thursday to oversee the probe, which is being led by the police's criminal investigation department, two police officials told Reuters. The official, who like other police spoke about the investigation on condition of anonymity, said the military's domestic intelligence agency was also involved in the probe. A military intelligence agent told Reuters he was instructed to monitor Ko Ni in the months before the lawyer's death. The intelligence agency was primarily concerned with finding out how the suspect obtained a firearm, ownership of which is tightly controlled in Myanmar, the official said. The suspected shooter - named by police as Kyi Linn, 53 - was arrested after a group of taxi drivers chased the him down. One of the drivers was himself shot and killed. Despite a ban on police talking publicly about the case, photographs showing parts of a report on Kyi Linn's interrogation have spread widely online. Officials believe the images were leaked after police used the messaging app Viber to share them with colleagues. The leak sparked a race on social media - use of which has rocketed in Myanmar since recent telecommunications reforms - to identify a man who, according to the document, Kyi Linn said enticed him to shoot Ko Ni. Facebook users posted photos of purported suspects, and analyzed CCTV footage from the airport to devise often far-fetched conspiracy theories. Many in Myanmar distrust the police, who are under the remit of the military. Police themselves have made contradictory statements on whether suspects are under arrest or not. The office of President Htin Kyaw said late on Friday that a 46-year-old named Aung Win Zaw had been detained in the early hours of Monday, just hours after Ko Ni's shooting, in the eastern state of Kayin, which borders Thailand. Aung Win Zaw is accused of conspiring with Kyi Linn to kill Ko Ni, the office said in a statement, adding that police were searching for more suspects. Police said Kyi Linn - who is charged with murder - has been jailed twice in the past for trafficking Buddhist artefacts, but was released in a 2014 amnesty granted by then-President Thein Sein. Another former cell mate told Reuters he thought Kyi Linn would do anything "for his business and money," adding: "I don't think he is related to any political and religious issues." In his home village of Sai Lyar, members of Kyi Linn's family were shocked by the news, carried by police and reporters who have visited their farming community in rural Sagaing Division since Sunday. "I am sure my brother would not kill someone on his own," Kyi Linn's younger sister, Win Kyi, told Reuters. "There must be someone behind him."